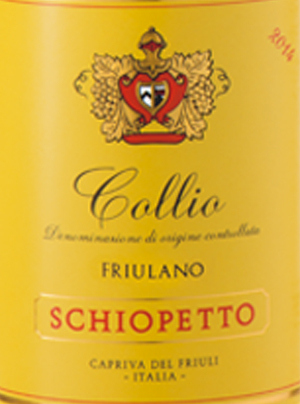 The Collio Friulano DOC Cru of Capriva by Schiopetto is a traditional wine with a strong typicality and personality, made exclusively from grapes of Friulano, grape historic the Collio Gorizia. 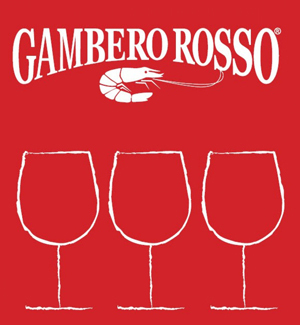 Excellent with San Daniele ham, dishes with eggs and asparagus. Interesting with Oriental cuisine. THE WINE The Friulano is an historical wine, all along called Tocai and that has always been the wine of the Friulan people. Aromatic, rich in structure, full and balanced. Its main characteristics are to be found in its bitter almond scent and in its balanced acidity. 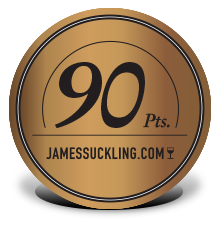 It ages well transforming its original fruity aromas into other more complex and full aromas: in the best vintages it has no rivals for quality. THE COMPANY History Everything started in 1970 in the vineyards around the Archbishop’s Palace at Capriva, ceded in rent to Mario by the church; vineyards which Mario completely rennovated and which finally became his property in 1989 after many postponements. Mario, fully aware that the real wealth and strength of the business, are the soil and the plants, transformed old unkempt terrain in vineyards cured in great detail, he worked hard to render his vineyards unique and he took advantage of the potential of the Terroir of “Ponca” ( typical Friuli terrain composed mainly of clay and limestone ). Gradually his children, Maria Angela, Carlo and Giorgio joined him in running the business, carrying on his project with sensitivity and respect, with love of tradition and real passion. In April 2014 the business passed into the hands of the Rotolo family who intend to maintain intact Mario’s mission and productive philosophy for the sake of continuity. 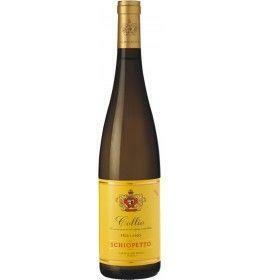 The Pioneers Mario Schiopetto, the master of white wine amongst the great producers of Italian wines. Mario soon became part of a group of producers who worked from the end of the 1960s and through the 1970s to improve and modernize the methods of Italian wine production. Mario travelled across Europe and USA with Luigi Veronelli to discover other wines and wine makers; with Luigi Soini he had many adventures and engaged in important discussions, he maintained a long collaboration with Professor Spath in Germany seeking new methods of production and vinification. In the 1980s Mario is one of the elite of Italian wine makers and he becomes teacher and adviser for many young wine makers, opening the doors of his cellars to them. Mission Every action, every activity of Mario Schiopetto was dictated by the desire to give voice to the territory via the wine in order to be able to tell a story in every glass consumed. Today the business continues its activity following in Mario’s footsteps, availing itself of his precious lessons, still valid today, maintaining a strong focus on innovation in order to guarantee high quality products and working with constancy and dedication, respecting totally the Earth and the environment. Susteinability Mario did not invent anything to create his wines, he merely tried to understand the soil, the climate, the character of his hills by careful observation and by trying to be in harmony with Nature. This spirit is still the fulcrum of the business dedicated to a project of total sustainability, starting from planting and maintaining forests positively balancing the inevitable production (emission) of CO2, to the careful use of products with a low impact on the environment and finishing with highly technical boilers which autonomously provide the necessary central heating by using wood and clippings from the vineyards. Before 25,71 € tax incl. The Friulano is an historical wine, all along called Tocai and that has always been the wine of the Friulan people. Aromatic, rich in structure, full and balanced. Its main characteristics are to be found in its bitter almond scent and in its balanced acidity. It ages well transforming its original fruity aromas into other more complex and full aromas: in the best vintages it has no rivals for quality. Everything started in 1970 in the vineyards around the Archbishop’s Palace at Capriva, ceded in rent to Mario by the church; vineyards which Mario completely rennovated and which finally became his property in 1989 after many postponements. Mario, fully aware that the real wealth and strength of the business, are the soil and the plants, transformed old unkempt terrain in vineyards cured in great detail, he worked hard to render his vineyards unique and he took advantage of the potential of the Terroir of “Ponca” ( typical Friuli terrain composed mainly of clay and limestone ). Gradually his children, Maria Angela, Carlo and Giorgio joined him in running the business, carrying on his project with sensitivity and respect, with love of tradition and real passion. In April 2014 the business passed into the hands of the Rotolo family who intend to maintain intact Mario’s mission and productive philosophy for the sake of continuity. Mario Schiopetto, the master of white wine amongst the great producers of Italian wines. Mario soon became part of a group of producers who worked from the end of the 1960s and through the 1970s to improve and modernize the methods of Italian wine production. Mario travelled across Europe and USA with Luigi Veronelli to discover other wines and wine makers; with Luigi Soini he had many adventures and engaged in important discussions, he maintained a long collaboration with Professor Spath in Germany seeking new methods of production and vinification. In the 1980s Mario is one of the elite of Italian wine makers and he becomes teacher and adviser for many young wine makers, opening the doors of his cellars to them. Every action, every activity of Mario Schiopetto was dictated by the desire to give voice to the territory via the wine in order to be able to tell a story in every glass consumed. Today the business continues its activity following in Mario’s footsteps, availing itself of his precious lessons, still valid today, maintaining a strong focus on innovation in order to guarantee high quality products and working with constancy and dedication, respecting totally the Earth and the environment. Mario did not invent anything to create his wines, he merely tried to understand the soil, the climate, the character of his hills by careful observation and by trying to be in harmony with Nature. This spirit is still the fulcrum of the business dedicated to a project of total sustainability, starting from planting and maintaining forests positively balancing the inevitable production (emission) of CO2, to the careful use of products with a low impact on the environment and finishing with highly technical boilers which autonomously provide the necessary central heating by using wood and clippings from the vineyards.